Quick Coupling Technologies has been established to focus exclusively on hydraulic Quick Disconnect Couplings (QDs), Check Valves and Ball Valves. Download or View the full Quick Coupling Technologies catalog. The QC-AG series couplings bring to the industry a proven design for use on construction equipment, forestry equipment, agricultural machinery, oil tools, steel mill machinery and other demanding hydraulic applications. The QC-V series couplings are widely used on excavators with attachment lines for Grapples, Hammers, Thumbs etc. They are also found on construction equipment applications where a higher working pressure and connect/disconnect under pressure requirements exist. The QC-HP series couplings, with their threaded union locking system and precision ball-type check valves, are designed for extreme high pressure applications such as portable hydraulic jacks. QC-A series couplings bring to the industry a proven design for use on construction equipment, forestry equipment, agricultural machinery, oil tools, oil equipment, steel mill machinery and other demanding hydraulic applications. 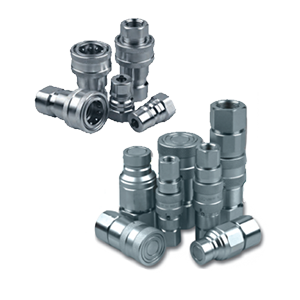 QB-B series couplings are used across the spectrum of hydraulic applications. These double shut-off couplings can be found anywhere that fluid transfer lines need to be connected and disconnected for operation or maintenance of equipment. QB-B series couplings are used in construction equipment, forestry equipment, agricultural machinery, oil tools, oil equipment, steel mill machinery and other demanding hydraulic applications. disconnected for operation or maintenance of equipment and where corrosion resistance is essential. QC-B series couplings are used in construction equipment, forestry equipment, agricultural machinery, oil rigs, oil tools, oil equipment, steel mill machinery and other demanding hydraulic applications. constitute a serious safety hazard. QC-FF series couplings are also used for the quick change of hydraulic tools in construction, railway, maintenance and mining industries and are commonly found on excavators and skid steer loaders. The QC-FB Series Couplings are widely used on wet-line kits for tractor trailers and can be used for submersible pumps, engine test stands and applications requiring connection and disconnection under pressure. The QC-ST Series couplings are non-valved for applications where maximum fl ow is required. The smooth open bore offers a very low pressure drop and is ideal for pressure washers, carpet cleaners and mold coolant lines. QC-CV Series Check Valves are designed to stop the flow of fluid in one direction while allowing free flow in the opposite direction.